The impact of financial innovation on the functioning of the international economy has become an integral part of the multilateral policy agenda. The announcement at the IMF-World Bank Annual Meetings in Bali on 12-14 October of the Bali Fintech Agenda in combination with the IMF Managing Director's Global Policy Agenda indicate that fintech is set to play a more prominent role to address monetary policy and financial stability concerns. This reflects mounting dissatisfaction with prevailing international monetary relations. The positive role attributed to fintech may hint at a new readiness to integrate fintech in monetary and financial policies. Discussions around the Meetings repeatedly highlighted concerns about the U.S. economic policy stance and calls to rebalance the international financial system away from dependence on the dollar. Official representatives in particular from East Asia and Latin America stressed the need to promote regional financial integration, facilitate local currency payments and reduce foreign currency indebtedness. 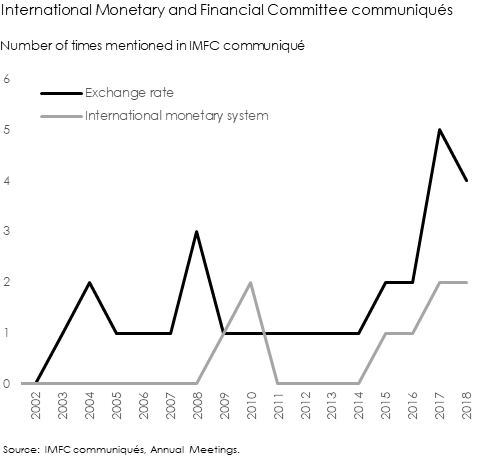 The desire to move towards a more multi-polar international monetary system was frequently acknowledged fuelled in large part by the current U.S. policy stance. The Meetings served as a reminder that the grievances about the international monetary system are real and that there is greater urgency to identify possible resolutions. The Bali Fintech Agenda is intended to harness the benefits and opportunities of financial technology in the provision of financial services. During the agenda presentation, emphasis was put on the role of fintech for financial inclusion, deepen financial markets. improve the resilience of the financial system, reduce the costs of cross-border payments and easing access for small and medium-sized enterprises to financial services. The presentation stressed that fintech allows to establish a new level-playing field in financial services and to leapfrog old banking legacies. There was recognition that better foundational infrastructures including telecommunications and digital and financial infrastructures are needed amid reiteration of the World Bank’s aim to offer universal access to broadband by 2025. The IMF Managing Director Global Policy Agenda highlights the IMF's policy work intent on central bank digital currencies (CBDC) and their relevance for monetary policy and financial stability. To address issues raised in the Bali Fintech Agenda, the IMF will look at the implications of fintech for cross-border capital flows, financial integrity, global monetary and financial stability and the evolution of the international monetary system. The relationship between fintech and the need to reshape international monetary relations hints at a new international economic policy agenda. The recent appointment as new IMF Chief Economist of Gita Gopinath, a renowned expert on exchange rate matters, provides a further fillip towards greater emphasis on the implications of monetary relations for economic policy formulation and conduct. The combination of CBDC and the international monetary system suggests there is recognition that fintech can fundamentally change the properties of currencies and money, possibly altering the propensity to hold currencies by residents and non-residents and thereby offer new approaches to manage international liquidity.3 This would help to address long-standing dissatisfaction among policy makers in particular from China and emerging markets of the persistent dominant role of the dollar in the international economy. The promise of fintech to deliver needed innovation for the international monetary system seems evident to many. Yet, policy makers took time to consider the positive linkages between monetary innovation and prospects for improving international monetary relations. The elevation of fintech to the highest international policy agenda now offers prospects of greater fintech integration in economic policy making. Herein, CBDC is set to assume a special role. The tokenisation of currency seems to provide among other significant advances towards financial inclusion and facilitating international payments and exchange.4 Fintech could therefore become a catalyst not only to transform national payments but possibly significantly more so to upset international monetary relations towards the establishment of a more multi-polar international monetary system. 1 Communiqué of the Thirty-Eighth Meeting of the IMFC, 12 October 2018. The IMFC advises and reports to the IMF Board of Governors on the supervision and management of the international monetary and financial system and has in practice become a key instrument for providing strategic direction to the work and policies of the IMF. 2 Economics Commentary, IMF Annual Meetings—Exchange rates matter at last, 17 October 2017. 3 Economics Commentary, The international dimension of central bank digital currencies, 11 October 2018. 4 Economics Commentary, Central bank issued digital currencies and financial inclusion, 24 July 2018.